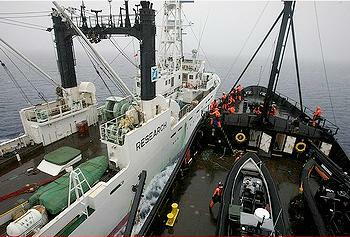 WASHINGTON, DC, February 14, 2013 (ENS) – The U.S. Supreme Court has rejected a request by the marine mammal conservation group Sea Shepherd to end restrictions on the movement of its ships near Japanese whalers in the Southern Ocean. But on the high seas, the whale defenders have the whalers on the run. Sea Shepherd, which for the ninth year is attempting to block Japan’s “research” whaling expedition, asked the Supreme Court Friday to end a lower court’s injunction to stay at least 500 yards away from the whaling vessels. Justice Anthony Kennedy on Wednesday rejected the application without comment, a Supreme Court document shows. “We plan to reapply to another justice of the U.S. Supreme Court,” said Charles Moure of the law firm Harris & Moure, Seattle, Washington, who is lead U.S. counsel for Sea Shepherd. “We are hopeful for a favorable decision,” Moure added. The U.S. Ninth Circuit Court of Appeals issued the injunction on Sea Shepherd on December 17, citing safety concerns as it reviews a lawsuit against Sea Shepherd brought by the Japanese Institute for Cetacean Research, ICR, a government agency that manages the Japanese whaling effort. Sea Shepherd attorneys contend that the U.S. appellate court has no jurisdiction over activities halfway across the world. The group claims to have prevented the Japanese from killing whales this season by keeping the four whaling vessels separated and on the run. “It is our belief that The Ninth Circuit Court incorrectly issued the injunction without any party filing a motion asking for such an order and without issuing a written opinion explaining why it issued the injunction,” said Moure. “Sea Shepherd is seeking relief with regard to the injunction while awaiting the Ninth Circuit’s opinion,” Moure said. The Japanese whaling agency earlier this week filed a motion with the same appellate court accusing Sea Shepherd of violating the injunction when its ship, the SSS Brigitte Bardot, approached whaling vessels on January 29. The Japanese are asking the court to find Sea Shepherd in contempt, which could carry serious legal penalties. Sea Shepherd has not denied that the Brigitte Bardot, a former ocean racer named after the French actress and animal rights activist, followed the whalers. Sea Shepherd attorneys argue that the vessel is sailing under an Australian flag and is operated by the group’s Australian branch and so it is not subject to a U.S. court order. Australia and New Zealand are opposed to Japan’s annual whaling expeditions in the Southern Ocean, which the International Whaling Commission has designated a whale sanctuary. Japan relies on a loophole in the IWC 1986 global moratorium on commercial whaling that allows “lethal research” on whales. Japan sets its own annual quota of 950 minke whales, 50 endangered fin whales and 50 humpback whales. Susan Hartland, administrative director for Sea Shepherd, said the group is guided by the United Nations World Charter for Nature, and is the only organization whose mission is to enforce international conservation regulations on the high seas. 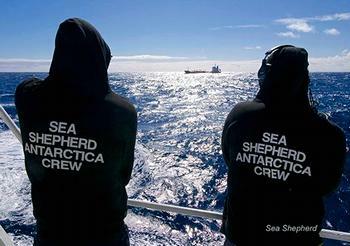 Out on the high seas of the Southern Ocean, Sea Shepherd Australia’s ship the SSS Sam Simon is tailing the refuelling tanker for the Japanese whaling fleet, the Panamanian-registered and South Korean-owned vessel Sun Laurel. The Sam Simon plans to follow the Sun Laurel in hopes to track them straight to the Japanese factory ship Nisshin Maru. Sea Shepherd Australia Director Jeff Hansen says, “An anonymous source within Korea has reported that the Japanese whaling fleet is in total disarray” with one of its ships, the Yushin Maru, low on fuel. The source reported that the Yushin Maru is separated from the fleet by hundreds of miles, very low on fuel and unable to proceed unless refueled. This indicates that the Yushin Maru has been totally abandoned by the Nisshin Maru and the rest of the Japanese whaling fleet in their hour of need, Hansen said. “The Japanese whaling fleet wouldn’t be in this predicament if they weren’t pariahs for their illegal whaling; unwelcome to refuel in any land-based port without scrutiny and banned from Australian ports, they must hire a refueling vessel simply to be fueled for their illegal poaching,” Hansen said. 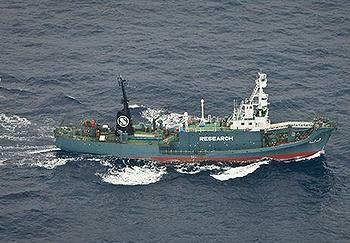 Rather than remain with their sister ship, or even transfer fuel to them, the Yushin Maru No. 3 instead chose to abandon the Yushin Maru in the treacherous waters of the Southern Ocean in order to chase the SSS Steve Irwin. Captain Peter Hammarstedt, aboard the SSS Bob Barker, said Sunday that this season’s whale defense campaign, named Operation Zero Tolerance,” has already scored many victories. “We intercepted the whaling fleet before they had a chance to fire a single harpoon,” said Hammarstedt. In addition, the Sea Shepherd’s four ships have: intercepted the whalers’ fueling vessel, pulled two-thirds of the fleets’ harpoon ships entirely out of operation, and kept the sole remaining harpooner with the factory ship running, limiting their ability to kill whales. The SSS Bob Barker continues to chase and hunt the whalers’ factory ship, the Nisshin Maru, unencumbered by a tail, and aided by a fleet of aerial scouting drones.